Bearings. If you are going to this trouble, use some top quality bearings. a. 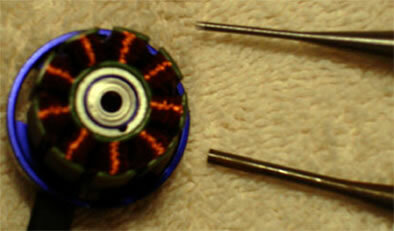 For this I will be using the Boca smr73c -20s Ceramic 3x7x3 bearings. Gallon size clear plastic bag. 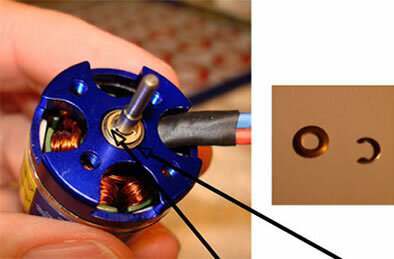 To begin, the motor has a very small C ring and step washer holding the motor together. If you are not very careful, the C ring will fly away during disassembly. This is where the large plastic bag comes in. Place the motor in the bag. 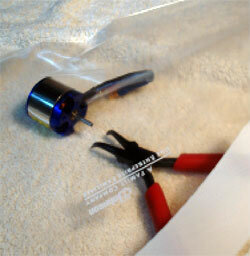 While holding the motor from the outside of the bag, reach in the opening with your pliers and push the C ring off. What will happen is that the ring is spring loaded and will pop off, but the bag will contain it for you. Put the C ring in a secure location for now. Then remove the step washer that is on the shaft between the ring and the bearing. Make note that the washer has a flat side and a rounded (step) side. The step goes toward the bearing. Look carefully at the picture and you will see the C ring on the shaft, and the brass step washer under it. After the ring and washer are removed, you can pull the motor apart. The magnets are very strong, but it will come apart. 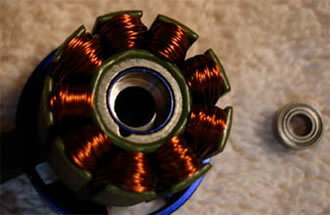 Once you have the bell off the motor, take a small flat tipped punch and insert it in the end of the motor. Go through the bottom bearing and angle the punch so that it touches the lip of the top bearing. With a wooded mallet, very lightly tap on the punch so that it dislodges the bear from its housing. It shouldn't take too much to knock it loose. Repeat the process to remove the bottom bearing. The hardest parts are now done. Next step is to install the new bearings. Simply push them in the housing, being careful to start them straight. If you get it right, they will push in most of the way by hand and just need to be seated completely. To finish seating them, I use a C clamp with a dowel rod to push them in all the way. TIf you got them started straight, it won't take much pressure with the clamp to push them in completely. 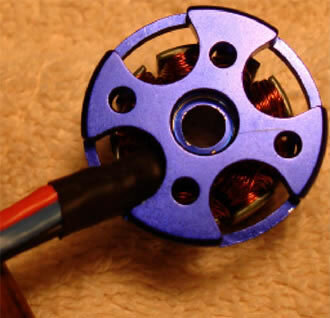 Make sure that the bearings are in all the way, and flush with housing. If you don't get them in completely, you won't be able to get the C ring installed later. Completely seated bearings. Reinstall the shaft and housing and then put the motor back in the plastic bag, and install the step washer with the flat side out. 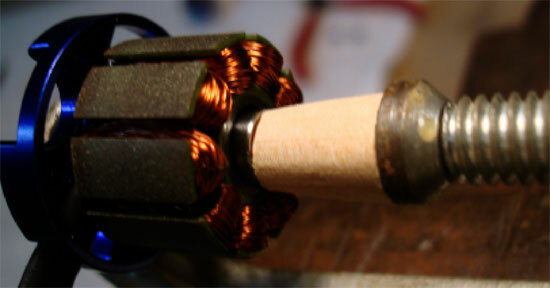 Place the C ring on the shaft, and seat it in the groove by carefully squeezing it onto the shaft. If you can't get the ring in the groove, make sure the bearings are in all the way.